Less than a week after I delivered the ostensibly completed manuscript for that my second cookbook (just 40 days now! ), I received an email from someone was looking for a recipe for a chocolate-vanilla marble cake like the one her grandmother had made, one that had great texture and wasn’t too sweet. She said that no recipe she’d tried had achieved this, and could I help? I became obsessed; I loved the idea and I fiddled until I came up with a marble cake I loved, moist, deeply chocolaty in the dark swirls, but no throwaway blandness in the light ones… and then I added it to the book. Editors love this, by the way, almost as much as mine loved the ten recipes I swapped in in December and the three in January, and the introduction that I didn’t write until February. Seriously, just let me know if you ever want me to write that How Not To Write A Book Book. What a tease, however, that this isn’t that marble cake. (That one is really good though! I thought I’d hand it off to friends and my family basically blockaded the door.) (Geez, Deb, stop rubbing it in.) What I wanted to tell you today is what happened after I figured out how I wanted to marble the cake, which is that I found it so much fun, I couldn’t stop. I started marbling everything. Marbled chocolate graham crackers. Marbled gingerbread bars. And then one day I even made marbled banana bread and I shared it on Instagram Stories and I don’t think I have ever received so many requests for a recipe. At my typically snail-like pace of output, this brings us up to today. Banana bread is perfect fall/back-to-school food anyway, can we pretend I “meant” to do that? And this version, which is 50% this jacked-up classic (my favorite) and 50% this double-dark chocolate version (seemingly everyone else on earth’s favorite) is thus the literal definition of “best of both worlds.” I know for a fact that all of our weekends will be better with this in it. Have you gotten to check out the book tour for Smitten Kitchen Every Day? It begins the day the book comes out — October 24th — and I’m so excited. I hope your town is on it. I hope this means we finally get to meet. And if you’re in Minneapolis, Nashville, Denver, Atlanta or Montreal… we should have more good news soon (eee!). Heat oven to 350°F. Butter a 9×5-inch loaf pan, or coat it with a nonstick baking spray. Melt butter in the bottom of a large bowl in the microwave. Mash the bananas right into it until mostly smooth. Whisk in brown sugar, egg, vanilla, baking soda, and salt until thoroughly combined. Add 1 cup of the flour, stirring just until it disappears. 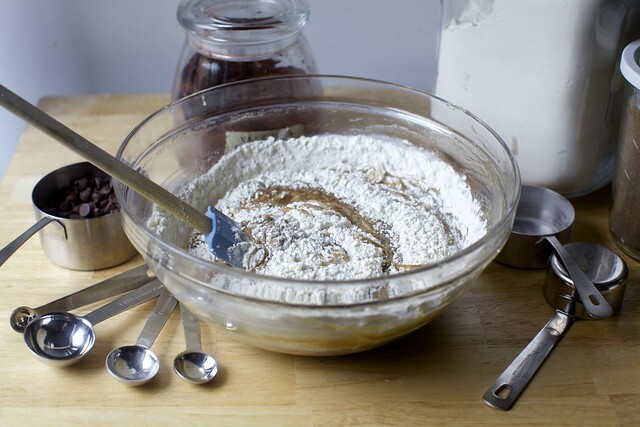 Pour half of batter into a second bowl. (You can eyeball it, it’s fine. Or you can know that my batter halves were roughly 365 grams each, but weights will vary with banana sizes.) Into one bowl, stir the remaining 1/4 cup of flour and ground cinnamon. Into the other bowl, stir in the cocoa powder and chocolate chips. Dollop batters in large (see pictures above for an idea of size) alternating spoonfuls into bottom of prepared loaf pan. Attempt to “checkerboard” the rest in, roughly meaning that you’ll drop a chocolate batter dollop on top of a chocolate-free one and vice-versa until both batters are used up. Use a butter knife or small offset spatula to make a few figure-8s through the batters, marbling them together — but just a little, say, 2 to 3 figure-8s. Any more and the swirls may not look distinct when you cut the cake. Bake 55 to 65 minutes, until a tester or toothpick inserted into the center of the cake comes out batter-free. (A melted chocolate chip smear is expected, however.) Cool in pan for 10 minutes, then run a knife around the edge and invert it out onto a cooling rack. Serve warm or at room temperature. Do ahead: The banana bread will keep for up to 4 days at room temperature. I keep mine wrapped in foil. Like I wish I had more articulate things to say, but… this just looks delightful and I want it. Your Double Chocolate Banana Bread is up there on my fave bakes of all time, so you’re right about it being everyone’s favorite. :) Has there been any attempts of swapping melted butter for browned butter in that recipe or will chocolate just cancel out that flavor? :) I think the browned butter goes really well with the non-chocolate half. Not saying it would be unwelcome with chocolate, just less noticeable. I’ve been pining for this recipe ever since you posted it on insta! I even screencapped the stories I was so obsessed. Guess we know what I’ll be doing this weekend… Thanks for this Deb! I hope your proof reader put a “T” in Dutched in the book. Otherwise, this looks just about perfect! Thanks, now fixed. This recipe isn’t in the book. Hi Deb, do you swirl the batter as you go, layer by layer, or do you dig in at the end to make the figure 8s? Just at the end; go deep. I find less is more with the swirling. I love your jacked up recipe and so I’ll have to try this one but I have one question, what happened to the booze?! Do you think it would be good added to this or is there a reason it was left out? What happened is kids ruin everything. ;) I just don’t pour the bourbon in baked good like I used to. But it would delicious here. Any particular kind of chocolate chip you recommend? Semi-sweet? Dark? I usually use semisweet for baking. Could you tell me – clueless foreigner – what is semisweet chocolate? The percentage of cocoa? The most common semi sweet chocolate in the US is Nestle Toll House Semi Sweet chocolate morsels. Depending on where you live, there is likely an American foods distributor that brings it in. I used to be able to find it in London. Scratch that, more like 55 – 65%. I am Australian and when a recipe calls for semi sweet I just use our dark chocolate chips, or a roughly chopped block of the original Old Gold (It is often cheaper then chocolate chips and I love the look of roughly cut chunks). Looks gorgeous and I’ll get round to trying it some time, but I’m still one of the ones who thinks your jacked up banana bread can never been improved upon. It’s SO good, no additions necessary. this looks AWESOME and is perfect for back to school – thanks! So… me and bananas have a thing. As in, they do not like me and my stomach does not like them. Problems arise when I eat them. But, this looks delicious. Anything I could sub for the bananas? Applesauce? Avocado? Maybe apple sauce? A thick fruit puree would be the right idea here. Rich is good too because bananas provide a lot of moisture. I’m going to try this idea with zucchini bread – while i have a lot of frozen bananas right now, I also have too much zucchini. Could I substitute the banana for pumpkin? It might work! For reference, this is my favorite pumpkin bread. Pumpkin bread with chocolate is PERFECTION!! A swirl of cream cheese works nicely with this combo. Strawberries or peaches would make a nice bread. IF it helps, I have a banana muffin recipe that I substitute other fruit in all the time – generally 1 1/2 cups of fruit puree is a good sub for the bananas – I’ve used applesauce, pureed strawberries and raspberries and peaches. Could you please add the weight of the chocolate chips? And the cocoa? I feel like cocoa powder is one of the worst things to measure by volume. It gets so clumpy and weird. And the bananas, please? “Large” bananas may not impact the result much, but how many cups or ounces, please? Don’t have a banana weight at this moment but the chocolate chips would be 4 1/2 ounces or about 130 grams. Is dark cocoa powder different than regular cocoa powder? If so, can I sub regular dutched cocoa powder? Made this with some frozen bananas and HOLY COW was it good! I’m thinking of trying it with peanut butter chips instead of chocolate chips next time. Of all the gin joints….no wait, that’s a different ….oh well let me just say that your recipes are the most reliable out there…which is why you cook book is my go-to wedding gift. This recipe is no exception…just exceptional. I followed it exactly and the result is so good that I fear I will finish the whole loaf before my family gets home. Thank you again. Does the banana flavor come across strong in this bread or more of the chocolate? If so, any substitute ideas?? I love bananas, but not so much in bread? I am not a fan of bananas but this has me intrigued. The Egg & I in Las Vegas has a banana muffin that is excellent. Simply put, it doesn’t taste like an overripe banana. As far as banana taste how does this cake rate? It looks amazing. Lovely recipe. Now I need to try marbling. I made banana bread yesterday and my husband despaired that it wasn’t chocolate. It does however have raisins infused with rum and crunchy chunks of walnut (Nigella Lawson’s Domestic Goddess cookbook). I have baked the Double Chocolate Banana Bread SO MANY TIMES! This recipe is the best of both worlds. PLUS anything marbled is way more fun fun fun! So good! I baked in glass at 325F and it took 70-75 minutes for the center to set but the outside was very well-browned and delicious. I always have to lower the temp for glass or else the outside will burn and the inside will be wet. 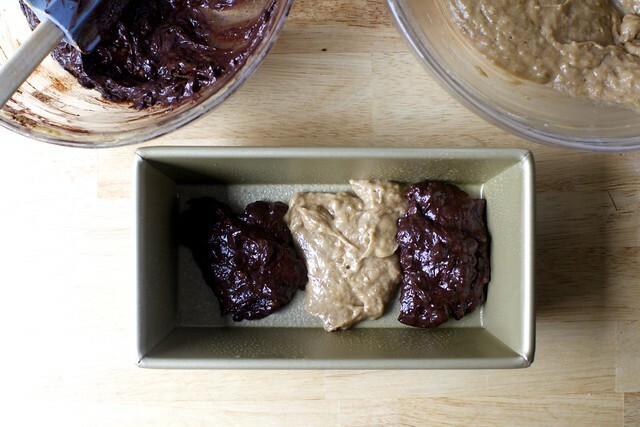 My kids helped with mixing and they love this chocolatey banana bread. My Yiayia made the most incredible marble bundt cake — deep chocolate batter swirled into orange-scented yellow batter, and none of it very sweet. So excited to try this one, and to check out the recipe in the new book! I had exactly three over-ripe bananas on my counter. What a wonderful coincidence! Delicious, easy recipe. 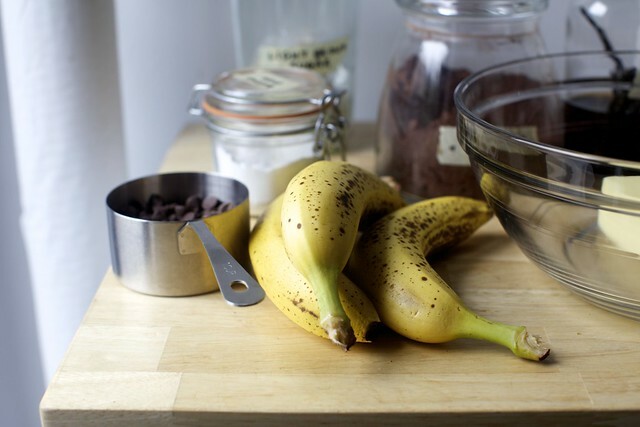 I always put the odd overripe banana in the freezer, just as is, so I am ready to bake this as well! I just wanted to say, I made this but doubled it and baked it in a 9×13 pan at 375 for an hour. When it came out I let it cool a bit and glazed it with a brown butter glaze. I was nervous but It turned out perfectly!!! I served it as little snack bars at a get together and it was devoured quickly. Thank you! Thanks. You may just have answered my “what shall I make for coffee time at church next week” question. I have two loaf pans, which unfortunately are both just a little too big for this. So, tragically, I was forced to triple the recipe and split it into two pans. (I added some bourbon to the batter as I am wont to do.) I brought one to dinner with friends, and gave the other to our neighbors, so I wouldn’t eat them all by myself (as I am also wont to do). Thanks for the brilliant idea! How much bourbon, when did you add it? What is it with grandmas and marble cake? Mine made one too, in a bundt pan. Two of the ingredients i remember from when I peeked at the recipe 20+ years ago were “1 small can Hershey’s syrup” and Presto flour. As a kid I loved it so much, but based on the presence of Hershey’s syrup, it’s one of those things that is probably better in my memory than in reality. So I was at the grocery store today and thought, should I buy bananas? And I decided, no, I don’t need bananas. I have a jar of chocolate hazelnut butter I have to use up.. is there anyway I could it here in addition to/instead of cocoa powder? Not sure; can’t hurt to mix a couple spoonfuls in but in general, at least peanut butter tends to make baked goods more dry and crumbly, so not too much. you could put the hazelnut butter in between the layers of the checkerboard bit, then swirl it in, or as my partner does, eat slices of banana bread with a thick swirl of peanut (or in your case hazelnut) butter – how he is not a larger man I do not know! Made this today, gluten-free for my husband. Scrumptious! I used 135g all-purpose gf flour and 30g buckwheat flour. Already half gone! A dignified end for our overripe bananas. I love your double chocolate banana bread, but this came out even better. I let the butter brown, then threw in the still-cool bananas (they had been in the freezer, and had thawed an hour or so) to stop the butter from burning. I also beat the egg til it was frothy, and used a 8 x 8″ pan since I cracked my loaf pan putting it straight from the fridge into a hot oven. I ended up with a thick, incredible cake, almost 3″ tall, with a more sturdy texture than banana bread usually has. Thanks so much for sharing your continued genius in banana bread development! I also don’t have a loaf pan right now, so did baking it in a 8×8 pan turn out like a cake texture, or more like a loaf of bread? Thanks! Coincidentally, I had 3 bananas on the counter, and plans for banana bread. What timing! My kids have deemed this the best ever! So delish! Absolutely perfect. I may be the only person on this sight that thinks your crackly banana bread is the best- i make it so much people know that’s what I make with bananas now! I swear this was fate – I was staring at a pile of overripe bananas in my fruit bowl and poking around for a good recipe when I came to your site and found this at the top of the page! I made it tonight and it is delicious. My husband who hates bananas (!) loves it too and had seconds! Yummmm. Thanks! Also I just want to thank you in general – whenever I make one of your recipes I feel totally confident that it will be great because you’ve tested it so much and explained it so well. I’ve never been disappointed and it feels nice not to have to worry that I’m wasting my time on a dud recipe :) I really appreciate all of your work!! Banana, chocolate, and chocolate chips? Thank goodness I can use my oven finally! I don’t know what’s going on, but your ads are making your text jump all over the place. Reading your recipe and story is really hard. Is there a way to make the ads stop resizing? I know you’ve got to monetize, but this is a little ridiculous. I’m sorry; it’s not me choosing to give anyone a terrible experience out of greed. Badly coded ads slip through and the second I find out about them, I let my ad guys know and they take them out of rotation. I’m not seeing one today; can you tell me what it’s for so we can get rid of it? Its almost a month since i baked and was going through your site yesterday for a recipe. And voila, got an update on FB today morning of this lovely marbled banana bread. I can almost inhale the smell of it just by looking at the wonderful photos. And definitely wanted to bake it early in the morning. Unfortunately its a working day and a long list of chores waiting to be done. But this is definitely going to be made today evening, no matter what may happen. Also, All the Best Deb for your cookbook. Your recipes are always risk free because of the effort you take before posting. It can’t go unrewarded. Sorry for the late feedback, especially when I have made the Marbled banana bread twice. The 1st time it came out like a dream. The 2nd time, I got a bit careless and burnt the top. But that didn’t stop me and my family members on basically inhaling it off. I have to improve on my swirling techniques though. Adding a little pinch of nutmeg along with the cinnamon portion increases the flavor. Thanks Deb for the wonderful recipe. I must serve this for our Yom Kippur break fast! Any recommendations on how to make a great gluten free banana bread? One of the comments above shared her substitutions for gluten free bread. This looks good with the marbling. I do not like banana s. So is there a non banana marbled cake recipe you could recommend ? Well, there’s one coming in my new book, but that’s not much help today. You could try swapping the bananas with a cup or so of applesauce; haven’t tested it but it should work okay. I’m a big fan of one in the 60’s era 5 Roses flour cookbook. Was always my kids go-to birthday cake. Don’t know if 5-Roses is only Canadian, though. Dorie Greenspan has a couple of recipes (traditional marble loaf cake and double chocolate marble cake) that you might look into. I’ve only tried the traditional one, but I remember enjoying it. What do you think about doubling or one-and-a-half-ing the recipe and making it in a bundt pan? Doubling in a bundt would be wonderful. Yay!! Thanks so much, this will be perfect brunch addition ! How long would you bake it doubled in a bundt? 45min? Sorry was too excited to finish reading the recipie… would you increase bake time tho? Not sure without testing it how different the baking time would be; might not be much different at all (if it’s equally thick, which it could be). Can’t wait to upgrade our standard choc chip banana bread to this. So excited that you’re (possibly!) coming to Atlanta! Would this be good with browned butter? Worth the extra effort? Never mind, I see you already answered my question! This looks really great! I printed it and hope to make it soon. Your recipes are delicious, and your intro to them always makes me smile, inspiring me to make the recipes! I have a small request, though: When printing your recipes, the large header makes the recipe often run over to two pages. If the header (the SK) were smaller, most would fit onto one page, I find. In the interest of saving paper, binder space, and the effects on the environment, wold you consider making the header smaller, or integrating it into the text somehow, so recipes would fit on one page? Thank you — I will look into it! Deb, the person having difficult reducing one of your recipes to one page because of the header may be mistaken, may not be cutting and pasting, or may not be using a Print Preview screen which I only do if I’m on a desktop. In any case, if I cut and paste a recipe, I can delete the header (maintaining your identity, of course) so the recipe fits whatever I need. If she’s using a desktop, she can adjust font size etc, to make it fit. Perhaps you and/or your elves can suggest something. Those of us blessed to have small devices never print a recipe out anymore. We store them in on-line files that we access in the kitchen. Saves paper and permits the addition of notes after we’ve tried a recipe. Just to let you know that Susie is not the only one with this “complaint” (really, a small one – your commentary, recipes and directions are GREAT!). As to the suggestion to cut and paste – yes, I have done this, but it is so much simpler to just print it out directly. Some of us continue to love paper copies of recipes – the smudges that develop over years of use prompt memories of the good times when they have been used. Love this idea! However, as a backyard banana grower with a freezer full of little 3-4″ very ripe fruits, I wish recipes included either a weight or volume measure for the bananas! Best of success with new book – looking forward to it. I only had whole wheat flour in the cupboard but made this anyway — it was delish. Very crumbly and hard to cut into slices but I assume that was because of the flour. Well done, Deb, another triumph! Made this last night because by some miracle I had exactly three bananas lying around that were way too ripe for anything else. I ate a slice for breakfast this morning and it was the perfect sweet counterbalance to coffee, plus the marbling turned out so pretty. Next time I might add walnuts! Just made this this morning and it is soooo delicious! And I really like the mix of flavors — not having the whole thing be chocolate actually somehow makes the chocolate parts taste chocolatier (is that a word?me) My only suggestion is to marble the bottom layer before adding the second layer of batter on top of it. Cutting through both layers at the end didn’t mix the bottom one fully for me. Same here. I put my offset spatula in all the way but still the lower half had no swirling. I wrote myself a note to swirl in between checkerboard layers next time. seconded!!! please come to charleston! I am not sure but can ask! Amazing! Excellent way to use up my over ripe bananas! Just made this today, and it was fantastic! I should add that in my haste, I divided the batter more 60:40 than 50:50, so mine turned out to be more of a chocolate banana bread with regular banana bread swirls …a mistake for which I have no regrets :) This is my second smittenkitchen recipe in a row (first one was the mixed berry buttermilk bundt cake) that has knocked it out of the park, can’t wait to keep baking. Thanks Deb for another winner! Excellent recipe, really clever, thank you. I’ve made the double chocolate banana bread several times – this version really made us smile and even made me leave a message here, first time ever I’ve made a comment online!! Can I fold nuts in this batter? Thanks so much, Deb. I’ve been making a marble cake out of a 60’s era 5 Roses flour cookbook of my grandmother’s for ever, so I am thrilled to add the banana factor. Will make this this afternoon and laugh at memories of my grandmother’s famous/infamous banana bread. I worked at a Dairy Queen through my high school summers, and we always had leftover bananas. My boss would give them to me to take to my grandmother, who would transform them into an amazing, dense banana bread (we joked that it was so heavy, you could use it as a doorstop). I always got at least one loaf to take back to the DQ staff! As I’m on a teacher self-funded leave this year, I can honour that tradition by taking one of these to my school staff. Looking so forward to seeing you in Toronto. Deb, this was the best banana bread we’ve ever had. Thank you. So happy to see this recipe…I’ve had some ripe bananas waiting all week on the top shelf on my fridge for something spectacular. I cut down on some of the brown sugar in your recipe and subbed in a little maple syrup. Wow, did that add some flavor to an already stunning bread! Shawn (or anyone else): Do you think a straight maple syrup replacement would work? (According to my calculations, I’d need to use 0.45 c syrup and reduce the liquid elsewhere. My question’s about flavor. Was the partial replacement super maple syrup-y? Came here to say that the jacked up classic is my absolute go to favorite banana bread. Deb, you are not alone. The marbling tip made the diff, I ten to overdo. I had TWO very large bananas on hand and the bread still came out beautifully. Chocolate and banana combos always grap my attention. The entire recipe took 15 mins to pull together-perk! for last min prep ideas. I can’t pick fav SK recipes, they all work for me! Is bake time really 55-60 minutes? Mine seemed to bake more quickly? Mine too. I set the oven timer for 50 mins. and tested it at 45. Done. I didnt mention it earlier because ovens vary and I used one less banana. Best to check iven at the 45 min mark to be safe. That’s how long it takes for me; how long did yours take? Might your loaf pan be larger? OMG My poor Aunt Punkie’s chocolate loaf cake (so rich it doesn’t need icing, or even powdered sugar) has been usurped by this marvel as my go-to food gift. I made this yesterday to deliver to a friend who’s had open heart surgery. He called my cell about a half hour after I left it on his front porch and raved about it. I meant to leave out a couple tablespoons of the batter to bake for myself and I forgot. So, today I had to make it again for myself (and those at work tomorrow who deserve a treat). Densely rich chocolate and moist banana swirls. Thanks for passing this on. It will go into my regular rotation. Mmm even though it’s been usurped, could you share the recipe?! Here’s Aunt Clarice’s (Punkie) chocolate cake. I pretty sure it was a Hershey recipe, though, as it specifies their brand of chocolate syrup. Cream butter or margarine with sugar. Add eggs, one at a time, alternately with dry ingredients and syrup. Bake at 350º in greased, lined round pans for 25 minutes or in loaf pan for 45 – 60 minutes. I just made this and I’ve got to say it’s now my favorite banana bread recipe by far! I used frozen bananas (because that’s all I had) and thought it came out perfect. This is absolutely delicious!! I got rave reviews – even after reducing the sweet things to 1/2 c. sugar and 1/2 c.chocolate chips. Still delightfully dessert-for-breakfast-like! I ❤️ you so much. There’s truly no need to follow anyone but you. I have a quick question. My husband is gluten free so I used an all purpose gluten free flour for both the marbled banana bread and the brownie cookies but it was far more successful with the cookies. Which g.f flour would you recommend for the bread to give it a better hold? Which blend do you use? I’ve had good success with a lot of quickbread recipes using Better Batter. Just be sure to measure by weight (Better Batter weighs 140 g / cup) and not volume. You’ll probably still find that the bread is a little flatter than you are used to (less rise) but the crumb / texture / flavor is spot on. I’m sorry, I haven’t tweaked this with gluten-free flour but perhaps someone else will chime in soon; someone usually does. I just pulled this out of the oven–it looks good, but my batter was much runnier than the one pictured, and the cake is only an inch and half high! What happened, ya think? Yes! We had slices with coffee this morning and I’m thinking a scoop of vanilla ice cream on top would make for a yummy dessert. Mine was also a pretty short standing bread. I also was wondering if I did something wrong or used too big of a pan? Tastes amazing either way! Mine also came out really short. My pan looks the same size as Deb’s although I didn’t actually measure it. I felt like I didn’t have enough batter, rechecked the ingredients (all was in) and worried it wouldn’t be a decent size loaf. A bit sad as it’s for a bake sale and won’t produce pretty tall slices. I just bought my tickets to your book tour stop in DC mere moments after they went on sale like the groupie-level crazed fan that I am. Yep, Deb, you’re that good. Groupie level good. Can’t wait to see you in person. Made this bread this past weekend – AMAZING!!! love seeing fun recipes like this! I’m one of those people who thinks that marbled cakes are dry and unpalatable. This is not the case here. I was intrigued by the banana marbling and goaded into making this by my son. Moist and delicious. I dare say that half the loaf is gone already! Nice recipe! Also, I only used half the butter and used half unsweetened applesauce. Noticed no difference. Yum! Made this two days ago and while it tasted great that day, this is one of those recipes that gets better and better with age – it was absolutely perfect for breakfast this morning. I used a chocolate bar that I chopped into chunks because it’s all I had on hand, and also had to sub 1/4 cup white sugar as I only had 1/2 cup of brown left in the cabinet. Like one of the other reviewers, I did have some trouble with the cake staying together, but I suspect it’s due to the fact that I was overly cautious with the marbling and didn’t blend the layers quite enough. Next time I’ll be sure to be a bit more aggressive with my figure-eights. Thanks again for another winner, Deb! The minute I saw this recipe, I knew I had to make it. I prefer to bake with weights, so I took my 3 bananas and weighed them. Two 6-7 inch bananas and one I’d frozen for smoothies, 100 g. Together they weighed 317 grams. According to Rose Beranbaum’s cups to weight, 1 cup of mashed banana is 227 g.
I’m not sure I liked the chocolate chips. Their melting pockets caused the bread to fall apart. I’d put this in the ‘snack cake’ category, but who cares!! My husband immediately ate two large slices and I had one. There goes the healthy meal I’d planned. Super good recipe. Now, if we can just get peanut butter in it. I followed the recipe exactly and next time I make this (tomorrow?! ), I will reduce the chocolate chips from 3/4 cup to 1/2 cup. A hit! for all interested as marbled muffins of a normal size they taste delicious 1 got 12 and they took 20min at 350 degrees. they are delicious! Debs..the next time you ‘marble’ a batter, could you please do just a quick video of the method and a shot of a slice once you’ve baked it would be nice, too. That’d be so helpful. I guess I am an over-marbler. My cut slices look more like I did a poor folding job rather than a deliberate swirling. I think the top of the batter looks like it isn’t swirled enough compared to what has happened below the surface. I love banana bread and this looks fabulous. Perfect for when the kids come home from school. A good snack. Thank you for the recipe. I want the marbled chocolate graham cracker recipe! and the marbled gingerbread too! This was my favorite banana bread of yours yet (and I’ve made them all)! The swirls made for such a lovely loaf, and then I gussied mine up even more with banana slices on top–one half dusted with cocoa powder, the other with brown sugar. The perks of having 4 “brown, spotty, past their prime and about 36 hours from luring in fruit flies bananas” when a recipe only calls for 3. Love, love, love them! Ahhh! I’m so excited you are coming to Denver. I moved from Chicago 2 years ago and my husband wasn’t looking forward to listening to me moan about you being there and not here. Yay for adding Denver to the list!!! Oh my goodness! I saw the post on instagram yesterday and I made it as soon as I got home. It was absolutely perfect. I wouldn’t change a thing. My pregnancy cravings were thoroughly satisfied. This one is going on rotation! Didn’t have any languishing bananas, but did have too much zucchini…so I made a mash up with you zucc bread recipe to make marbled zucchini bread. So delicious!!! Have another loaf in the freezer, we’ll see how long i can hold off! I made this with four (medium-ish) bananas and white whole wheat flour, and it was perfect! I was nervous, because I’ve never marbled anything before, but the instructions were really clear, and I’m so pleased with how it turned out! I made this tonight with 3 children running around making mayhem. I got halfway through the recipe (already divided the batter) and realized I forgot the bananas. I added them at the end. I also used almond extract (1/4 tsp) instead of vanilla. It is still delicious. Need to work on my marbling (and reading). I just made this marbled banana bread and I may need to buy a new wardrobe in a larger size. I can’t get enough of it. Delicious!!! I made it exactly according to the recipe. It is moist, chocolaty and the banana flavor is subtle. Another Smitten Kitchen winner. Thank you!!! Homemade banana bread is my son’s favourite treat. Adding cocoa and chocolate chip for would be heaven for him ! Made this last night– perfect for a rainy afternoon. I made it in a 8×8 baking dish, checkerboarded the batter in 3×3 blobs before swirling and it was done after 45 minutes. The chocolate part is SO CHOCOLATEY, and yet I was pleasantly surprised how “not too sweet” this tasted. That’s my primary concern with baked goods (I don’t love sweets) and this also means I have no problem eating it for breakfast right now :) Thanks for another great one, Deb! Excited to see you in Boston. Oh, Deb- one more thing: because you’ll be in Boston on day 2 of your book tour (hooray! ), for those of us who pre-ordered your book on Amazon, do you know if it will ARRIVE on 10/24, or SHIP on 10/24? I just want to be sure I’ll have a book for you to sign. Would this work with the Lodge cast iron loaf pan L – 10.125″, W – 5″, H – 2.75″? I will add my voice to the chorus of praise. I make your Jacked Up Banana Bread all the time to great acclaim, but have never made Chocolate Banana Bread. This marbled bread was awesome and possibly even better than the Jacked Up Banana Bread. I particularly loved how you limited the number of bowls by starting with the same base batter. Another winning SK recipe! Thanks! Delicious! I used 1/4 cup melted butter and 1/4 cup canola oil. Deb, this is just so good (like literally everything you post)! I am a loyal Smitten Kitchen groupie but infrequent commenter…but felt compelled to tell you that my coworkers are going to lose their minds over this tomorrow. Thanks for everything, and l’shanah tovah! I made this yesterday and gave it away so I’m making another one today. So obviously it’s another winner! I made this using Cup-4-Cup GF flour substitute and it did not turn out well. The cake didn’t seem to bake so much as “set” and was reminiscent of cookie dough. I baked it the full time and I have never had a problem using cup-4cup before (it is designed to substitute in equal amounts in any recipe) so I don’t know if it is the recipe or the flour substitute, but I thought others who need to bake GF would be interested to hear of this result. I also thought the bread had too many chocolate chips (and I’m a chocoholic) and tasted too much of cinnamon; the banana flavor was lost. I am going to stick with Mark Bittman’s banana bread recipe in the future. I have Celiacs and I use cup4cup almost exclusively and unfortunately it can’t function as it claims, but it’s close! The blog Gluten Free on a Shoestring does an incredible breakdown of gf flours, including a better substitute for cup4cup. For this recipe I added an extra egg and used weight measurements where a cup of flour equals 140 grams of my cup4cup gf flour. I find that for most quick bread recipes adding an extra egg and using the different weight equivalent for flour makes a huge difference. This was a hit in my house of non-gf people so if you’re willing to give this another shot again maybe those tweaks might help. I was happy with the results of my GF adaptation. As @Another GF Anon suggests, I added an additional egg and also increased the baking soda to 1 1/4 tsp. Since my GF flour blend doesn’t include xanthan gum, I added 3/4 tsp. After letting the batter rest for 15 minutes, I baked it at 325 for 80 minutes, until the internal temperature was 210 F. The loaf got a nice rise. This looks amazing! Mouth watering as I type this. This was super easy, and really yummy. As always. Follow the directions exactly and you’re set! sO YUMMY!! I love chocolate and search new chocolate recipes, now after a long time, I got the fabulous recipe. Thanks, share more chocolate recipe. And yes nuts may appear as well……. We will be gone for a week. Three very large very ripe bananas taking a time out in the freezer . Tried this and absolutely loved it. The chocolate sections were the main event for sure, but it’s still worth it to have the light sections just for the visual effect of the marbling. Thank you!! Oh, yes. Looking at it, it brings to mind a marbled cake of some sort with jam in it. Or maybe peanut butter and jam. Would Nutella marble well? The possibilities make good “Supposings”. Speaking of marble cakes, Did you try Alice Medrich’s Tiger Cake during your latest bout of cake trials? In this case, tiger refers to the stripey-ness of the cake. Tiger cake is an olive oil based marble cake that seasoned with, somewhat oddly, white pepper which, with the fruity olive oil imparts an almond flavor and gives it a somehow…tigery? warmth. I highly recommend it! My 12 y. o. daughter didn’t care for this – said it was more like chocolate cake with banana. I felt like the banana flavor was too strong and overwhelming. (We’re like Jack Sprat and his wife – lol.) I might recommend cutting back on the banana (or maybe using ones that aren’t quite so far gone) and the chocolate chips. It sure photographs beautifully! Deb. This…cannot… be categorized as bread. This is HEAVEN. This is a big banana brownie. I don’t know what to say except YES. Actually, on second thought, let’s go ahead and call it bread. Better for defending second helpings. I admit it. 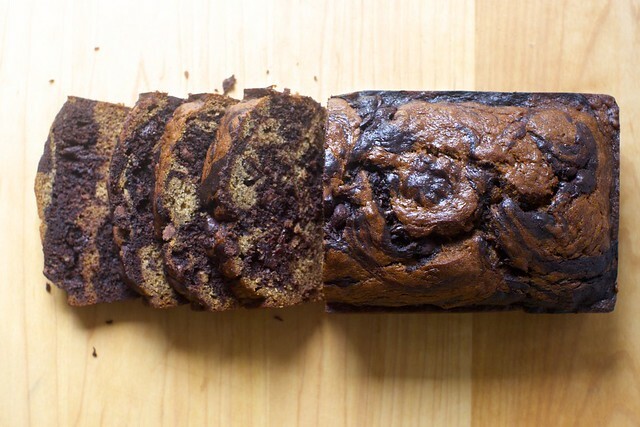 This is so much better than mine….yummy and from now on, banana bread will always be marbled with dark rich cocoa. …I wonder what it would be like to add some peanut butter to the vanilla portion? Was just curious why there’s not buttermilk in this and a teaspoon of soda and only one egg. Does this make the loaf quite dense? Thanks. It looks lovely. This looks delicious. If I have 5 slots for racks in my oven, where should I position the rack for baking? Wondering where it should good for optimal desserts! So, this seems like a silly question but I’ll ask anyway. How ripe do you recommend the bananas? The ones in the pictures look a lot less ripe than I usually use in banana bread. I am a long-time reader/follower but first-time comment-er. Made this yesterday and it came out so well. Very moist; and the banana flavor came through quite clearly in both the “regular” and the chocolate sections. The whole thing together was rich and delicious, though I think the chocolate part really made it. Also, the fact that I achieved the swirl made me very excited. As always, another keeper from Smitten Kitchen. Thank you, Deb! This is so so good!! Definitely giving this bread a try!! I made the Marbled Banana Bread. It was not only beautiful, it was delicious! Yessssss! Please come to Denver!!!! Please please please! Delicious! For other folks doomed to a dairy-free life like me due to dietary restrictions (or vegans who have made a decision to be so), I used an equal quantity of Miyoko’s Creamery European Style Cultured VeganButter to great success. I also live at altitude (5800 feet above sea level) and found that increasing the oven temperature to 375 degrees allowed it to bake in 60 minutes and wasn’t dried out. Like some of the other commenters, my bottom layer didn’t marble as successfully as the top, so I would definitely do more marbling of the bottom layer before adding the top layer in the future. I just made this and had a slice. It is just wonderful! It’s not too sweet so the banana and cocoa shine. It is really moist. Mine didn’t rise as high, but it’s pretty darn close. I followed the recipe exactly–came together fast and easy. Except for the batter covered spoon I dropped on myself. Oops! I might share at work… I might not! Thank You Deb for yet another great recipe. I followed the instructions and it came out perfectly – well perhaps not marbled quite as well as yours – but it looked great and tasted delicious. I’ll make it again for sure. Made this marble banana bread for a mini reunion I had with my family. It was DELICIOUS. Everyone was so impressed with how moist and tasty this bread was. Will make it again, especially for my grandkids. Will Really Love to try it. Made this last night because we ran a snack stand at my son’s football game on Sunday and had leftover bananas brown from sitting in the 90 degree heat. We had it for breakfast just now and it was AMAZING. Exactly as written. Love love love it. Hi Deb, thanks for much for all your wonderful recipes, I use them often! I have had a question for some time about your jacked up banana bread recipe, and the same one is coming up for me on this one. Would you be able to provide a weight measurement for the bananas? Sometimes bananas vary widely in size, and sometimes I like to use more than the recipe calls for a boil them down a bit to get a stronger banana flavor. It would be really helpful to know how much my end result should weigh. Absolutely loved this. Made a loaf to bring for my colleagues, and it disappeared! It is a short little loaf, but if you bake it perfectly, it’s moist and rich and perfect for a squat little slice (or 3). Dang it. I put it in the oven 5 min ago and just realized I used baking powder instead of baking soda. I go to google and type in “used baking powder…” and the third suggested search completion is “…instead of baking soda in banana bread” lol! So I wonder what will happen?? Hi! I tried making this today and it is delicious! Thanks for sharing. I didn’t have any chocolate chips on hand (terrible I know!) so I left those out. The taste is great but I find the bread to be quite crumbly…is that what you experience also? It’s still moist and not dry just falls apart very easily. Thoughts? Last night was a two recipe Smitten Kitchen night – Pizza beans and this bread. My kids love banana bread, but it has to be GOOD banana bread. This was amazing. I made it gluten free by subbing gf flour (having ingredients by weight is HUGE for this swap) and adding 1/2 tsp of xanthan gum. Otherwise kept everything the same. I baked in a 8×8 pan as I couldn’t find my loaf pan, so only baked for ~30 minutes. This was amazing!! Really, really good warm, but honestly, just as good this morning. I made this recipe yesterday. The only change I made was that I used four bananas that had been frozen, so they were very wet. It still turned out well; I just had to cook it 60 minutes. Thank you! Mine’s in the oven as I type and it smells like choco-banana heaven. And side note THANK YOU for being one of the only sites that consistently lists measurements in grams. I’m generally a terrible baker so I cannot deal with the cup guesswork on most other sites. I made this last night with three sad bananas, and it was the absolute best way to give them new life. My loaf isn’t as pretty as yours but it is so delicious. Thanks for another great recipe! This came out fantastic! I’ll bake it a touch longer next time (as Paul Hollywood would have said, “It’s underbaked”) but we inhaled it anyway. Deb, I’ve been making your recipes for a million years but I never comment and tell you how great they are — in honor of your new book coming out, I’m vowing to comment every time I make one of your recipes to say thanks. This marbled banana bread disappeared in a day when I took it to a gathering of 6 friends! Excellent, Deb!! I do have a question about the flour weights. Do you have more accurate weights for the cup and 1/4 c of flour? Because 4 * 35 = 140, not 130. I figure you got the numbers by rounding and that’s why they don’t quite add up. For me, if I’m going to actually weigh the flour and not just scoop and level, it’s just as easy to weigh out 33g vs 35g or whatever. Thanks for another great recipe, Deb. I made it this morning and it tastes great. I have one question. My bread came out a little less…perky than it looks like yours did. I seem to have this problem with banana bread; it often doesn’t rise that much. When I make “regular” banana bread, I don’t melt the butter, but I cream it, and this works pretty well. Any suggestions on how to get this (or any other) banana bread to rise a little more? I subbed the melted butter with liquid coconut oil (100g) and used 100g of dark brown sugar. Tastes delicious and so easy! I had help from my 2 and a quarter year old who frankly was more interested in eating the chocolate chips than mixing the batter! Just made this and the house smells like banana bread which is always a good thing :) this came out really well! Thank you so much for the recipe!! One note is that I only had to bake mine for 30-35 minutes and it was completely cooked… I’m pretty sure I used the same size pan so not sure what happened but it’s good to check the baking time in between! OMG. Have made the jacked up classic and loved it but this beats it. So moist and IMO better with the chocolate swirl vs all chocolate as less rich. Another smitten kitchen win. What’s not to love? Super simple and quick to make and tasted delicious. Baked this bread this morning using over ripened bananas that I previously froze. It was easy to make and very delicious. I will definitely be making this again. I will have to work on my swirling technique though . The marbling was pretty at the top, but it was just two separate layers on the inside. I LOVE this bread! I made 3 mini-loaves, and baked for 35 minutes each. Next time I’d use mini chocolate chips.. My two halves of the batter weight 395 g each. Oh boy, am I happy marbled chocolate banana bread is a THING! just made this tonight, and it’s amazing. I used 4 medium-ish bananas, Dutch cocoa, and dark chocolate chips – just, wow and thank you for this recipe, Deb! Every time I make one of your recipes, I spy another I just have to try! I can’t stop making this delicious, delicious bread. It’s a problem. I would love to make this dairy-free, can I use oil instead of melted butter? What amount of oil substitutes the amount of butter? Is there a general rule to follow? You can do 1:1 here. This is the second time I’ve made this and it is absolutely amazing! However, both times I have followed the instructions and my marbling is subpar. It still looks mostly like the patchwork from before swirling. The taste is wonderful and makes up for it, but I’d really like to figure this out. A video could help, so if you have time amidst the book tour, food network, two kids, dinner every single night [why?? ]…well, someday, a video would be very welcome. Ha! I appreciate you seeing my perspective too. ;) I’d do a few more figure-8s. If it’s still checkerboard-ish, it could still be marbled more. Or same amound of figure-8s and smaller dollops. Hope that helps; thanks for making me smile. This bread is soooooo delicious! Thank you for the recipe. Hahaha I made this months ago for the first time. The day after I read your chocolate banana bread!!! Everybody loves it. At my son daycare they asked me all the time because kids love it (I reduce sugar for them). Posted on IG some time ago!!! Deb, in all the years I follow your Smitten Kitchen, I still don’t know which is my favourite discovery, the wonderful creations, written recipes I swear have a perfume, as though the finished dish were hidden somewhere in the email…. or your writing and the wonderful humour you share. I must have your books, I Always lose reciPes because I no longer have patience trying to save them someplace and forgetting where ‘someplace’ is… writing them down and losing them in the unbelievably tiny place I call home, etc ad infinitum…. Deb, U R A JOY. I made this within 24 hours of reading the recipe, amazing! So, so good! The cinnamon in the “yellow” half gives the cake a warm, deep flavor that pairs so well with chocolate. Next time I’m going to double the recipe and make a layer cake! I just made this and it’s great, but a little heavy on the chocolate with the chocolate chips for me–if I leave those out next time should I add anything to that chocolate batter just to keep weight/proportions even? This. Is. Phenomenal. I’ve made it twice today because the first loaf disappeared so quickly. Can’t wait for some more bananas to almost go to waste! The bread tastes delicious, but for me the texture came out too moist and a little gummy. I had to bake it quite a bit longer than the recipe stated before the toothpick came out clean. My bananas were pretty large, so perhaps this contributed to the problem. Some changes just because. Blueberry banana devil’s food swirl! That is the most beautiful thing that I have ever seen. Anyone ever make this with mostly whole wheat flour and/or in muffin tins? Yes, I just made these in a 12 cup muffin tin and they took 20 minutes to bake at 350. Throw some icing on them and you have some pretty awesome cupcakes. With that much chocolate in the batter they veer more toward cupcake than muffin even without icing. If I wanted to take out the “marbled part” could I just add another 1/4 of flour and 1/2 teaspoon to the other half of the batter? I made this exactly as written and wouldn’t change a thing! Thanks for the great recipe! OMG – my bread looked just like Deb’s picture, a rarity for me. More importantly, it was delicious. Taking some tips from the reviewers, I added chopped pecans to the batter and instead of chocolate chips (which I didn’t have), I used chocolate shards. I also did a couple of figure 8s through the first layer, and the whole thing came out so amazing! This may be my homemade gift to friends this Christmas. So easy, so delish! How long did it take you to put this Banana dessert together? This was an easy tasty recipe to make. I feel like walnuts would be a nice to have and after reading your comment will add a little bourbon, I forgot to swirl deeply so will do that as it ended with pockets of chocolate, The recipe was a little runny, Wondered why since the pictures seem not to be so. My partner’s favorite banana bread! Everything about this recipe is perfect! It turns out I’m referring to your recipes a lot this holiday season. I used your chicken stock recipe, which I have used for years since first finding it, for something to do with our leftover turkey. Now, I’ve made your marbled banana bread. Both are really good. On hand I had Hershey’s cocoa and special dark chocolate chips. Even without your exact ingredients, it turned out very well. Thanks so much! Hi from the UK. Always looking for a great banana loaf recipe and this looks like it could be that. I am all for approximation, but surely 3 peeled bananas could be anything from around 150g to 3 times that or more. Do US bananas come in a standard size? How much should I aim for in weight please? PS loved the browniest cookies. An all time favourite. I made it and froze it for a party tonight and it was fabulous. Thanks for another great recipe. Your recipe is very nice thanks for sharing this post..
Just made these yesterday in a mini bundt muffin pan and then iced them with a thin chocolate glaze for my husband’s birthday. They make awesome cupcakes! They took about 20 minutes to bake at 350. This is one of my favorite dish.!!!!! If you love these kind of dishes then you may visit my website: https://www.tomatocafe.com which is full of sweet dishes also. Take it u r in the States. Is All Purpose flour same as Self Raising in U.K.? No, it is not. It has no leavener in it. I think you want “plain” flour in the U.K. This is so good. Told my friends and they made it immediately and also agreed. Chocolate and bananas are such a good combo. Apologies if this has been asked and answered, but… all I have is bread flour and we’re about to get a SNOWPOCALYPSE. Think this would work? Yes, I think it will be fine here. I’ve made a lot of banana bread in my life, and this recipe is hands down the best EVER! Ps I added one tablespoon bourbon to batter. Great recipe! I added a tablespoon of tahini and almond flour. I see people have had success making this into muffins (and I always have with both the jacked up banana bread and the double chocolate banana bread!). How would you suggest layering the batter so the muffins come out marbled? When you list cocoa powder is this unsweetened? This is amazing and so easy to make! I made it this past weekend and it’s been at hit at my house and at work. Not too sweet which is perfect! Can’t wait to make it again. I made this yesterday for my husband’s coworkers and it turned out great! The swirling is easy to do but looks very impressive. I used three medium bananas and it was still fine. A nice change from classic banana bread. Tried your recipe, with twice the quantity in circular cake pan.. Turned out really good.. Wonder recipe..
Will it turn out same with wheat flour + oats.. I liked the moistness and flavor of this banana bread (I used half whole-wheat flour and 4 1/2 very small bananas). I will try it again with less sugar—even using less than the recipe calls for, it is achingly sweet. Do you have the nutritional info for the recipe? I don’t but I use this site often when I’m trying to find the calories of something. I have been wanting to comment on the Marbled Banana Bread for some time now. I have spent much time and gone through many recipes trying to find the ideal one to use up old bananas, something I seem to always have. This is, without a doubt, my favorite! It is delicious, easy and also freezes well. I make it all the time and I can’t ever imagine growing tired of it. Thank you so much! I made this again last week, and used my Bundt pan – it came out a bit short (not tall) but baked in about 25 minutes. I’ve had trouble getting the loaves fully baked in the middle. And because I can’t resist fiddling with flours, I used about 1/2 cup of buckwheat flour, a couple of tablespoons of ground almonds and the rest wholemeal wheat flour. Half of the cake was gone in about 15 minutes as soon as it was out of the pan! Handsdown the best banana bread recipe. Moist and rich in flavour. Replaced AP flour with cake flour. Added brandy. Used Valrhona cocoa powder. Batter still gooey at 55 minutes. Took 70 minutes to bake this. My oh my!! This was an absolute winner! Just finished baking it and now it’s sitting on the counter to cool. I sliced myself the edge piece to give it a try and it’s so moist and delicious! My house now smells delightful with that chocolatey banana aroma. Definitely a crowd pleaser. Thanks for the recipe! This is one of the best recipes I’ve ever made. It was simple enough that my 3.5 year old daughter was able to help me measure and mix up the ingredients, but exciting enough (with the dividing of batter and additions of chocolate!) to make it really fun and interesting for both of us. We baked it in a bundt cake pan for 50 minutes, which may have been a few minutes too long (I’ll try 45 next time) but overall it tastes DELICIOUS, looks amazing, and smelled unbelievably good while baking. The addition of cinnamon to the “plain” banana bread batter, marbled with the chocolate batter, gives this bread an amazing depth of flavor. I can almost see someone *not* liking it because the flavor is so complex. But I love it! And so did the rest of my family. It’s not too sweet, but just sweet enough. Totally incredible recipe, I am so glad I found it. Thank you! Made it twice – loved it every time; will make it again! It’s easy. Followed the directions completely. Looks lovely sliced and is delicious! Made this and froze it for a week. Though I definitely under-baked it initially, I brought it to a potluck four hours away, and it was still well-loved. Agree with others on the need to swirl a bit more. Will definitely make again! I just found this and knew it would be just the thing for when my crew of kiddos get off the bus on the grey, cold, New England autumn day. Thank you for always inspiring my home’s ethos of food is love! Made this last night, wonderful. Wondering if I could swap out flour to use whole wheat flour? I love the Banana bread ! I used Bakers 100% cocoa powder, it’s unsweetened. Should I add sugar? Or use a different powder? What would you suggest the bake time be for muffins?? Wow, Its looking delicious. I love chocolate cakes. I would try it for sure. Thanks for sharing. My weekend is definitely better with this in it!! I actually made Marbled Banana Bread gluten free by substituting the flour with King Arthur Gluten Free Measure for Measure Flour. (Not an endorsement, just wanted to be clear on the product I used.) Stellar results for gluten free foodies and foodies without gluten intolerance, as well! The deep fudgy chocolate balances so well with the earthy banana flavor. I tell myself that this “bread” is healthy enough for breakfast, lunch and dinner. Thanks for the recipe! Made this tonight. Although I didn’t get my marbling to come out right , it was delicious nevertheless!! I added a little toasted walnuts :) yum. This was perfect. I used dark chocolate chips and wouldn’t change a thing. Four of us ate half the loaf in one sitting. This recipe absolutely, positively rocks! I doubled the recipe and put the batter into 3 smaller pans. The reason being: One …I usually freeze my loaves and it’s easier to cut the loaves while frozen for quick lunch treats or afternoon/evening snack! Two: I have 2 daughters … so, share and share alike! I baked the loaves for 35 – 38 minutes at 350! I usually have bananas floating around in my freezer, so this recipe took care of those! I have more bananas to use up, so I am thinking this might be excellent for small Xmas gifts! This is a win win recipe! I highly recommend and …kudos on a great find!!! I am not sure what happened. 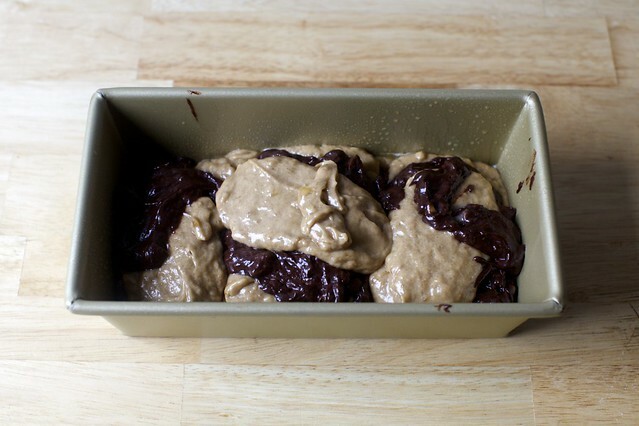 The batter is divided so it can be marbled; half has additional flour (to keep it as non-chocolate banana bread); the other half has added cocoa (to make it chocolate). The batter halves should be about the same consistency. I always get a pretty good rise in my loaf pan. Thank you for the response! I realize I added both extra flour and cocoa to the same bowl. Oops. Still tastes yummy! I am not a fan of the taste of baking soda..can I use baking powder or half soda and half powder? Any way to cut down the butter and / or sugar!? This was easy and delicious!!!! Love this recipe – thanks! My first successful cake! Followed your recipe to a T and the family (who tend to stay away from my cooking haha) loved this! THANK YOU for sharing! Deb, your banana bread recipes are amazing. I was going to make one each of the Jacked Up Banana Bread (sans bourbon due to kids) and the Double Chocolate, but when I read that the marbled one was a fusion of two, I took my batters and made two marbled loaves! So delicious. My son said to make sure this gets on our “make again” list! So, I made this Marble Banana Bread Monday. Today is Wednesday. There are 2.5 slices left – if I you slice them t h i n… that’s how good this bread is (was)… did I mention there are only two of us in the house. Yeah. It’s that good! Made this tonight. My family loved it! Delicious and easy! Thanks for posting. Ok so I baseline don’t love banana bread but I made this tonight because I had several bananas on their last legs and I’m a sucker for Deb. I doubled the recipe and baked it in a glass 9×13 pan at 375 for 40 minutes and it was perfect! Cakey but keeps its crumb, I think I’m in love. I used mini chocolate chips instead of regular sized chips and they melted nicely without causing any separation. This is for sure my new go-to for fashionably ripe bananas. The fact that it’s pretty is almost too much for me to handle. This was delicious! I subbed flax egg and coconut oil to make it vegan. I keep finding excuses to pass by the kitchen to sneak another taste. Well done Deb! Perfection! I need to work a little more on my marbling skills but cannot think about a better recipe to practice on. Lol! I added a T of Maker’s Mark in honor of the jacked up recipe. So good! I’m allergic to milk/dark chocolate. Are there any substitutes for the chocolate and Coco? Looks amazing! Made this today during my Seattle Snowmageddon 2019 baking and cooking marathon (lemon yogurt cake Friday, baked chicken meatballs last night, oatmeal cookie dough today, and now this) and It. Is. Awesome. 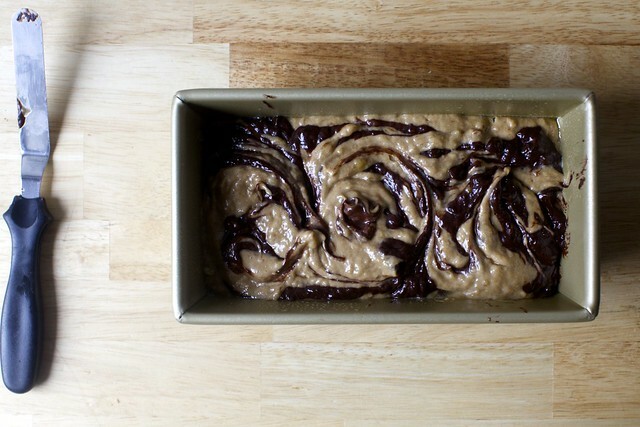 The marbling is beautiful, and this bread is neither too sweet, too banana-y, nor too chocolately. It is the best of all worlds! The two bowls / split the batter made me think it would be complicated to make and put together but it was not. Thanks, SK! Quite delightful and easy to make. Will repeat for sure. I added bourbon. I’ve made this a few times now and all my friends and family loves it! A friend even asked for the recipe. I made two adjustments—I reduced brown sugar to 1/2 cup, and chocolate chips to 1/4 cup. I find that ripe bananas are already quite sweet on its own and don’t need all that sugar. Next time I might even try 1/4 cup sugar instead! Baked for 50 minutes in my oven. I used about 4 small bananas. I found this to be dry and not banana-y enough. Tasted too much of chocolate. If you make it and also found it dry; I would take a slice of the bread from the fridge, pour a bit of chocolate syrup over it, then nuke it for 30 seconds. That made it moister like a chocolate lava cake. Made this today during a snow storm- had some bananas that had to be used up and everything else in the pantry. Wow, this was delicious, moist, chocolatey, and EASY! 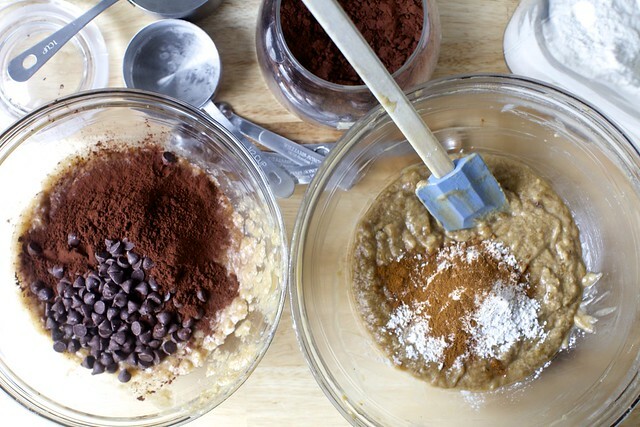 Really just mix it all up, divide into two bowls, later in a loaf pan and bake. Baked for 55 minutes and it was perfect. We usually make chocolate chip banana bread, but this might be our go-to banana bread from now on. I’m not a huge fan of banana bread. Once a year is good enough for me, but I think this recipe may have converted me. Recently, I made the double chocolate banana bread from here which was pretty good, but nothing more. Then I ended up with more overripe bananas and I turned to SK for a solution. I decided to give the marbled banana bread a try and I am so glad I did. It was fantastic. Even friends agreed that it was really, really, really good. Somehow this was the right combination of banana and chocolate. I know I will be making this again soon, even if I have I purposely overripe the bananas. Thank you, Deb! I forgot to add this stayed moist for a few days. I saved a slice for a friend and she was surprised that it still moist on the third day. I know some of the people have said it was dry, but I didn’t find that to be the case. Does anyone have thoughts on substituting oil or something else for the butter for those with dietary restrictions? It shouldn’t be a problem at all.